"The Inugaruligasugjuit were huge and powerful men and women who were several times larger than the average Inuit. Many of these lumbering beings were opportunistic and took advantage of the smaller human inhabitants. Some even saw humans as easy prey and hunted them down for food and sport." "This book is the product of more than a decade of research. I have used obscure texts, archives, explorer accounts, and elder interviews to create the most comprehensive collection of Arctic giant stories ever assembled...all the giants described in this book come directly from Inuit folklore." "I believe that these beings we call giants lived on our land long before our time here. 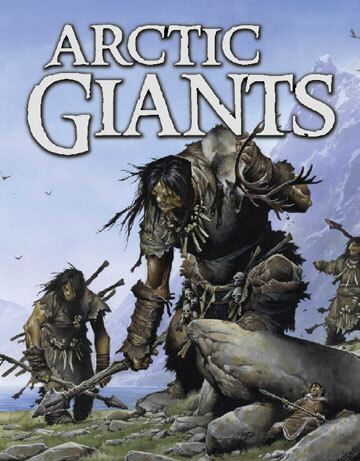 Stories and fables passed down from our ancestors tell of creatures called ijirait, giants who snatched people and stole them away, and amautaliit, giant women wearing amauti who stole human souls. - Mark Kalluak:"
A pronunciation guide is helpful and daunting; the list is long. As with all stories from the oral tradition, there is grave concern that, with the passing of the elders, the stories will cease being told and thus, disappear. So much has already been lost. Thankfully, this book will help to keep some of the old stories for a future time. It broadens the folklore of Canada and offers a rich history of Inuit oral culture. The detailed image-rich artwork brings these powerful men and women to glorious life. ""Luke, you've got to believe and understand this. A thousand things - more than a thousand things - all worked together to put Gracie in that exact spot at that exact moment. Unless you can find a way to make yourself responsible for every last one of them, then you've got nothing to feel guilty about."" I knew within a few pages that this was going to be a book I could not put down. I loved the characters from the moment I met them, and I hung on to them as they dealt with prejudice and love, with small-mindedness and integrity, and with great happiness and deep despair. "She was partly hidden by a bush, kneeling on the ground with her hands bunched in front of her chin as though she was praying. Her face was framed by brown hair that sprang from her head in loops and spirals. The position she was in put me in mind of an oversized prairie dog in spite of the navy skirt and red blouse she was wearing." ""Why, just that I never knew of any school where the boys and girls play much together, not at your age." Carmella's advice holds strong until rumors start flying about Gracie and her mother Raedine, who takes a job at the local hotel that is also a brothel. It is soon discovered that Gracie is an illegitimate child, with no father. Prejudice and innuendo raise their ugly heads and Gracie becomes a pariah at school, shunned by the girls and teased mercilessly. Gracie seems little bothered by it all, but Luke is devastated by the treatment she receives and comes to her defence. Friendship and love is a stronger force than pettiness and prejudice. Luke's parents set a good example for him, accepting Gracie into their household despite their misgivings about her mother, and offering a safe place for her to stay while Raedine is working. They do not explain what is really happening and that leads Luke to draw some of his own conclusions and to listen in on conversations to learn more. "By that time most of the boys my age had completely lost interest in ignoring me. It didn't much matter to me, for I'd come to realize that Gracie was worth a whole heap more than any other friend I had - more than all of the others combined, in fact." 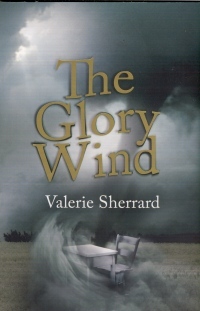 I have read other books by Valerie Sherrard and have always admired her writing; but, this must be close to her best. I will have to check that out in the near future with the books I have not yet read. Her characters are flawlessly drawn, each playing a praiseworthy role in this brilliant story. The voices are strong, the themes are difficult to face, the telling is elegant and forever memorable. 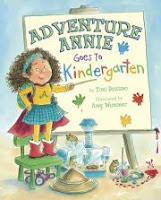 Annie is not concerned about her first day at kindergarten...she knows adventure awaits around every corner. The uncertainty comes in determining just what kind of experience it will afford. Mommy tries to keep a lid on the excitement by explaining that kindergarten may not be like any other venture she has had. "kindergarten is its own adventure." I give her the Adventure Annie thumbs-up." Off they trek to school and Annie's first meeting with her teacher, Mr. Todd. Annie's enthusiasm leads her to her first meeting with her classmates. She is quick to introduce herself. When circle time comes and Mr. Todd sits to explain the Kindergarten Gold Star Rules, Annie is anxious. She wonders when the adventure is going to begin. Her gregarious nature soon has her in a bit of trouble with the teacher, who reminds her about the rules set out for everyone to follow. As she goes about her day, everything in her back pack becomes part of her search for a Gold Star adventure. After inadvertently breaking several rules with no loss of zeal, Annie settles to try and earn the gold star she covets. Afternoon snack time offers an opportunity to prove she is reliable; but Mr. Todd chooses others to fetch the milk. When they don't return, he sends Annie in search of them. Inside voice intact and walkie-talkie in hand, she is off to find the wayward monitors, searching every nook and cranny of the school as she goes. Her crusader cape helps her track them down and return to the classroom with milk and monitors in tow. Bravo, Annie! Any kindergarten teacher will recognize Annie in one, or more, of their students over the year. This winning team brings her to clear and ebullient life right before our eyes. She is a force to be reckoned with, and makes her mark from the very first day! We know before we open its pages that this is 'a story that ends with a kiss'. Throughout its delightfully charming pages, we are oft reminded of that promise. It begins when a chicken and a frog fall in love. It hasn't happened before, and is not likely to ever happen again. But, there you are! The frog is not rich. Wanting to provide evidence of his love, he offers a ring...a golden ring. It is dropped in all the excitement it garners. While there is worry about what might happen to the ring, we are assured that the story will end as promised. The swam can't stop the ring's journey. She offers a broad back for transportation. A rabbit's help is sought but the ring flips away. Will his skateboard provide the speed needed? A tricycle riding goat, a motorcycle mutt...nothing works to stop the ring's escape! "On it bounced to the town square. A whole new dilemma which requires a feat of daring...and a hilarious result for those involved. It's worthy of a celebration and a surprise ending. For sure, it's a kiss! The energetic watercolor illustrations are bursting with action, expression and enthusiasm. Young listeners will love following the ring's journey as it gleefully bounces from one animal to the next, and finally comes to rest on the place it was meant to be! "I watch the shearing from the top of the hay barn. Good place to sleep, this. Tigger's somewhere here. I can smell her. There she is, up on the rafter, waving her tail at me. She's teasing me. I'll show her." This is definitely Russ' story and he narrates it with charm and intelligence as we would expect from a sheepdog. 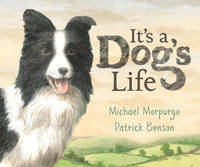 It's his life and he wants his readers to know just how the days play out for him as a working dog on a small farm. He's a happy dog, with good people and attentive care. He knows what he is there to do, and he does each of his many tasks with pride and skill. Before he hopes to beg breakfast scraps from Lula, he's off to talk with his friend Smarty across the valley and to bring the cows, ready for milking. A sip of milk and a warm thanks are all he needs before heading back to the house. Breakfast is served, and shared. They don't recognize each other without their clothes on. Not very bright, that's the trouble with sheep." Crows are chased from the cornfield, and Russ is soon in need of a drink at the stream. He and Smarty have a Tigger (the farm cat) hunt and tree her, which leads them to moving on to the next bit of work. The calves need to be herded; then it's time to meet Lula and walk her home from the bus. A birthday tea is had and a special gift arrives. Will her birthday present change her feelings about Russ? Lovely, watercolor artwork perfectly matches the pastoral beauty and lively action of a day in the life of a farm dog. The use of light and the varying perspectives add interest and detail. "However, lemmings are also known to fight with each other. They will bite, punch and squeal at their opponents. Lemming skins can be used as bandages to heal cuts and more serious wounds." It's not often that we see books written in Inuktitut and in English. Inhabit Media is changing that. This book about the wildlife of the Arctic has text written by a Nunavut author, with an English translation to make it accessible to a wider reading audience. The introduction is brief and concerns the importance of wildlife to the people of the Arctic. 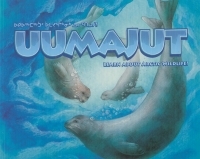 Two chapters follow, describing those animals that live on the tundra, and those that live in the sea and on the ice. The book includes a lovely illustration of each animal in its stunning Arctic habitat, on a double page spread. The facing page gives a description of that animal in both languages and provides details about the animal's appearance, what it eats, common behaviours and traditional Inuit uses. Readers will recognize some of the animals portrayed....the wolverine, the lemming, the arctic fox and the beluga. Others will be less familiar and will serve to add to their store of knowledge about this vast and beautiful place. I know about Arctic char as a delicious menu item, but cannot remember seeing one prior to this reading. I am surprised with its size and the varied colors. Others include the Peary caribou and the amphipod. I found it most fascinating to learn about the ways the animals are used by the Inuit...how they use the animal parts to meet their needs. They have valuable lessons to teach us about waste. This is a great introduction and is certain to lead interested readers to further research about the animals portrayed.
" Do I like BLUE? I do, I do! I ride BLUE to the beach. too many, though, to reach." Kids who are learning about colors need books that help them see those colors in the world that surrounds them. The bright framed photographs that Arlene Alda has uses for her newest book offer much to discuss with those kids as the book is shared. The title page background is a fiery red and offers up a photograph of a table filled with row upon row of candy that is every color of the rainbow. Their mouths will be drooling and they will be recognizing favorites, while wondering about ones they have not yet seen, or tasted. Now, that's an invitation to come on inside and see what else is there! GREY is clouds without the sun. Well, that's true. She goes on to show the many colors that make up our world and ends with a big surprise! The rhythmic pace carries readers along as the author shares her day's journey, giving them focus for a walk that they might take themselves...with camera in hand. "It took ages to clear up and put all the things back so that Bella Yaga would not guess any of them had been used. After that she had to wash the slime off her feet and then clean the slimy footprints off the hall floor. Earwig nearly fell asleep on the floor while she was doing that." Earwig has no concerns about living in an orphanage. She has a great deal of power there. She has often been passed over when people come looking for foster children. Imagine her surprise when an exceedingly eccentric pair take an interest, and then take her home with them! Earwig has been at St. Morwald's since babyhood and she has come to enjoy the comfort that it offers. She has friends, and is able to get most everything she wants by asking for it. When she is taken to the home of Bella Yaga and The Mandrake, life changes dramatically. She soon discovers that Bella Yaga isn't particularly interested in her personality or her company; rather, she wants Earwig to be her servant. She is meant to fetch, carry and bow to the wishes of the witch who has become her 'mother'. But Earwig is nothing, if not determined and independent. She has no intention of going peacefully into servitude. She enlists the help of a 'familiar'...the cat Thomas. She is not averse to sneakiness, and is soon stealing magic potions from Bella Yaga. There's enough humor that I basically smiled my way through the entire read. There's a touch of mystery, and certainly some magic. What a great book to share with a child, and an excellent introduction to the work of this brilliant storyteller. We are all sad that this is her last book, but delighted that it will find a new generation of fans. If this is your introduction to her body of work, don't stop now. There is so much more to enjoy! 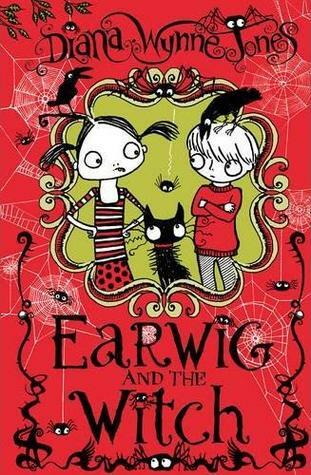 I love the bright red cover, the quirky characters, the spiders and crows that adorn each page. They provide context for the early reader and a creepy, funny backdrop for this droll tale. Do you think that the busyness and the noise worry Pete? Well, if you know Pete, you know the answer to that question. Goodness, no! There is always the concern that the second book about a beloved character won't measure up to the first! You can be just like Pete...worry no more! 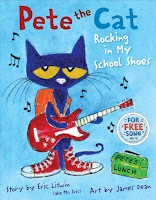 In this book that takes Pete to school, and in his school shoes no less, we find him discovering the many spots that are part of this new environment. He uses his shoes to give him the confidence he needs to explore them. With those shoes to bolster his confidence, he is never at a loss. Whether it's riding the bus, reading in the library, having lunch in the cafeteria, or sliding on the playground, Pete has no worries. He's got his shoes and they are all that he needs! "When early explorers sailed to the Americas, many of them reported seeing mermaids along the coast. Today, we know that they were probably looking at manatees." If you have not yet seen this amazing series of books from National Geographic, get out there and look them up. I counted 26 Face to Face titles on their website and I think that every one of them would provide hours of reading pleasure for interested young readers. The format doesn't change much, and that makes these books even more accessible and helpful to avid researchers in the early and intermediate grades. 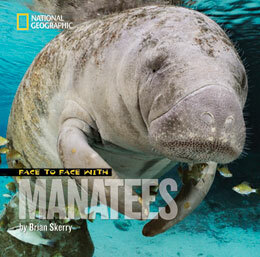 Brian Skerry has been photographing the ocean and its stories for three decades. His passion for his subject is obvious in his stunning work, and in the text he creates to accompany it. Having spent more than 10,000 hours underwater, he knows his subject intimately and is able to convey that knowledge to his audience. "Katherine turned around. She was face to face with a young manatee. It was curious and wanted to play. They swam together gently, moving away from the shore. When Katherine stopped swimming, the calf turned around and came back to her. They swam together for about ten minutes. But for Katherine, those ten minutes will last a lifetime!" What an experience for a father and daughter to share! In sidebars we learn they love shallow water, they eat up to 150 pounds of food each day, and they can live 50 years or longer. As with other books in this series, Brian Skerry encourages his readers to take an active part in learning about the many animals of the ocean, and to help in the fight to preserve their natural habitats. He explains the cost to the manatee population from motor boats, harassment and the loss of their warm-water home. There is much to learn about these curious 'sea cows'. The more we know about them, the more likely we are to care about their future. A glossary, a list of related readings and websites and an index are provided for those interested in knowing more about them. Be sure to check for them at the library or your local bookstore. Oh, I know the kids who are going to love this book. While it offers up much information, it has the feel of a graphic novel. The bright, glossy pages are an open invitation for readers to come on in and learn the true stories of spies and their agencies around the world. In each case, mistakes were made. It is evident that much research had to be done to bring these stories to her readers. Tina Holdcroft has done a commendable job of finding bits of history long-forgotten and discovering the many reasons that missions failed or were discovered by others. There is an introduction to each new story, and then a graphic story giving all of the pertinent facts, adding humor through speech bubbles, signs, chapter titles and imagined conversations. There's a lot to be digested here but the author makes it easier with quick presentations and the allure of the graphic illustrations. Lots of details add to the information provided. The stories are varied, number twenty and have occurred around the globe. Advice is given, and not taken. Spies are caught and released. A mole is allowed to spy against the USA's intelligence for years because of a bungle. Readers will be intrigued and entertained. A section at the back of the book includes sources used, more books to read, documents read and websites that will lead to further study. All in all, perfect fare for its target audience. there is something here for you." I love the star-shaped rice cakes! Preheat the oven to 350. Peel the parsnips and cut off their ends. Then cut the parsnips into thin slices - try and make them all about the same size. Lay the parsnips on a baking sheet lined with parchment paper. Sprinkle with olive oil, and season with salt and pepper. Roast for about 30 minutes, turning every ten minutes, until golden." Here are Annabel's favorite recipes, with directions easy enough for some of our youngest readers to make with help from an interested adult. The ring-bound, flip over cooking cards are perfect. They stand on their own, on a sturdy A frame and take up little space on the kitchen counter. Flip through, find something that appeals and let the fun begin! Children and parents will find the directions easy to follow and accompanied by useful, full color photographs. Each recipe has an ingredient list, a numbered method , a preparation timeline, cooking time and how many can share in the fruits of the labor. Simple descriptions of the end result and numerous tips from Annabel add to the book's allure. There are Light Bites, Main Meals, Fruity Treats and Cakes and Cookies...all to delight the appetite and give young children variety in the meals they eat. Who doesn't want that? The Depression has made for many changes in Ellen's life. The family farm is failing; so her father has set off to find work in the west, with a promise to send much needed money home. Now, Ellen and her mother are uprooted from that same Saskatchewan farm to travel east to Toronto; they will stay with her mother's sister and help her with the work of her boarding house. Bad times are affecting everyone. Their work with Aunt Gladys assures food on the table and a place to sleep. Saskatchewan House is filled with people trying to make it in a much-changed and very harsh world. We don't really get to know them well, as they are only home to eat and sleep. For Ellen, the displacement of her family is concerning but she and her mother are making the best of a bad situation. They help where help is needed; and when her mother gets a job to help supplement their income, Ellen can be counted on to help Aunt Gladys. While her mother works, Ellen has time on her hands. As she sits reading in her room, she hears voices outside her window and wonders what they are saying. There is a huge elm tree outside her bedroom window; its green and leafy branches provide a secret place for listening and dreaming. As she sits there she hears the children who live next door and comes to know a little bit about each of them. 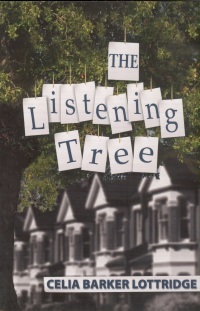 She enjoys the quiet, the solitude and the anonymity of her 'listening tree'. Then, one day, she hears something that spurs her to action. She must warn the children that a plan is in place to evict them for late rent payments. Despite her shyness, Ellen reaches out to the children and tells them what she heard. Together, they make a plan that will foil the evil-doer and give hope to the children and their mother. It takes time and commitment to formulate a plan but cooperation and concern assures a hopeful ending for all. The characters are well-drawn, the tale well- told and the action moves the story along despite the many hardships faced. Young readers will get an authentic feel for the times and the setting. We know that Ellen has found good friends in Charlene, Joey and Gracie. They will work together to solve just one of the many problems facing those who lived at the time of the Great Depression. With good luck, and good cheer, the future may not be so dire. "Although the silkworm was originally native to northern China, it is now bred all over the world. It eats one thing only: toxic mulberry leaves." Margriet Ruurs knows her audience and she has obviously done her research for this handy and user-friendly introduction to some truly 'amazing animals' for young readers. "The termite is one of millions in a colony, and they work together using soil, saliva, and mud, to build their mound. Termites build the tallest and more elaborate nests of any animal. A termite mound can be 6.1 meters (2o feet) tall and can last for years." 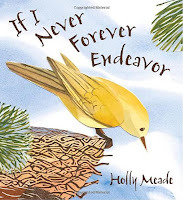 Kids who are already interested in nonfiction will find much here to keep them busy reading and those who have not yet tried it, might just find a brand new and intriguing way to look at the animal world. It sets the stage for them to go out and make some of their own discoveries and gives them a format for sharing newly learned information. It doesn't often happen that the writer has a say in the illustrator for her work. In this case, Tundra offered Margriet Ruurs a chance to suggest someone whose work she would like to see used. She wanted to work with another B.C. resident, W. Allan Hancock from Comox Valley. It is a great collaboration. This is a first book for the artist and he handled the work with great skill and detail. Using the animal's habitat as the backdrop young readers get a realistic and close-up look at the animals mentioned. Light and shadow play an important role, as does color change from brilliant hues to quite subdued. "The male betta fish lives in shallow, tropical waters and spends a lot of time making his bubble nest. He blows and gathers bubbles at the water surface, making sure there are enough to cushion the eggs that his mate will lay. When the female betta fish releases her eggs, he quickly collects them in the safety of the nest, standing guard until they hatch." Good work, Dad!! and smiles like a flower facing the sun. "Welcome!" she says. "My name is Yumi. What would you like to paint?" She ties an apron on me." Aspen Colorado Kim Chee Lee is our narrator, and resident author, for this smart and honest book about writer's block and finding inspiration. It's not her real name, but she uses it when writing stories about 'monkeys and elephants, aliens and robots, and, sometimes, about me'. "Last but not least, choose words and line them up - like a fruit seller who chooses her best mangoes and pomegranates and bananas and puts them on display". "You can only make a masterpiece if you're willing to make a mess". Willing to let her imagination go and daring to try, Aspen finally achieves success and is very proud of her accomplishment. The end result of the visit is that she has a story to tell! I love the fact that this book is vertically constructed. It gives young readers a new way of looking at books, and there are too few of them out there. The artist uses oil, pencil and collage to create her bright and sunny images. The pages are filled with interesting perspectives, detailed backgrounds and borders, and inspiration! Aspen's message is clear. When faced with a block in your writing, seek other creative outlets. Try something you have never tried before, relax and let the process guide you through the mess and the joy of discovery. Wait. What's that? A twitch? There just isn't enough excitement in Chick's life. After all, reading 'The Adventures of Wonder Pug' has got the heart beating faster and the need for adventure front and center. It isn't long until a lazy, slumbering pug comes into view and Chick is convinced that this particular dog is just what the doctor ordered. He must have adventure at his very core, despite his rather lethargic countenance. 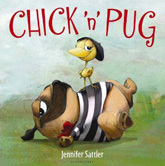 No matter what Pug does, Chick is convinced that he is ripe for adventure. A yawn produces a 'flutter' of excitement, as does his trying to get out of an annoying and cloying sweater. The fun comes in Chick's inability to face the truth of the matter. Always misinterpreting Pug's action will cause listeners quick giggles and a need for repeated readings. The expressive Chick is patient while waiting for Pug's to waken...dealing a hand of solitaire, checking the time, tapping toes and even chewing grass while lying there watching the clouds roll by. Chick is, in turn, endearing, hopeful, concerned, and determined to encourage his new friend. Pug suffers this new friend with indifference, worry and finally, gracious acceptance. The expressive artwork gives us characters to love and admire. No one is more upbeat and encouraging than Chick. No one could possibly be as relaxed and apparently unconcerned as Pug. They are a perfect match! "Here's a mini world in a jar, and the plant at the center is an insect-eating sundew. Place it on a sunny windowsill and sticky droplets form on its leaves. Passing insects stick to these and are digested to death. Team up the sundew with modeling clay aliens to make a bottle garden that's out of this world!" So many people today are concerned about the environment and want to play a role in sustainability for everyone. In this useful and appealing book we learn that everything shown can be grown in containers. All plants are easy to care for, and will provide endless hours of enjoyment and learning. What plants are, what they need for growth, and why we need them comprises the first chapter. Questions are answered, information offered, and detailed drawings and clear photographs ensure that readers make a great start! As we have come to expect from the team at Dorling Kindersley, there are detailed instructions given for every project suggested, and the photographs that accompany those ideas are useful when attempting them. After describing how to grow corn, children are encouraged to use the husk leaves to make paper for gifts and notebooks. Growing lavender from seeds leads to learning about herbal medicine and creating a sweet smelling lavender buddy. Thirty projects are described, each taking up little space as the plants can be grown in containers and the projects tried one at a time...do one or two things this year, and add to your repertoire next year. I learned a lot about growing herbs, and then using them for my baking. Mmmm! Basil and tomato muffins...what a way to start your day! What about rhubarb in one of those colorful plastic barbecue tubs? Poke a hole in the bottom, grow and pick the bounty of your labor (well, it really doesn't take much work) and then surprise guests with a rhubarb cobbler. Tips are offered by a host of vegetable characters. There is a glossary, an index and a great deal of fun to be had when you buy this book! "Almost 90% of an iceberg is hidden below water. The part that you see peaking up is only 10% - or as people say, "the tip of the iceberg." Icebergs in the ocean can be dangerous, because sailors cannot see the whole thing." What fun for intermediate students to take a trip in the pages of this book , which offers a lively introduction to the world as we know it today. It begins with geographic basics...exploration, what it's like to live on a sphere, measuring time, mapping, landforms, climate, population, and moves on to the continents. Borders begin that discussion and we are told that 'there are 195 independent countries in the world'. On we travel to North America. A map shows the separate entities that make up our continent...Canada, the United States, Mexico, Central America and the Caribbean. In 'need to know' information boxes, readers garner facts about crops, animals, language, holidays, sports, food and inventions. A map is shown and other important information is given in accessible paragraphs and other captions. 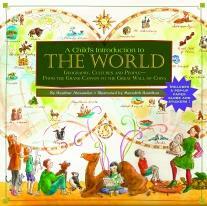 Each of the continents is described, adding interesting tidbits that young adventurers can tuck away for future use. There are projects to be shared, and a pop-up paper globe to handle. Reusable stickers are included which might require a return to the text to affix them to the proper place on the globe. The watercolor illustrations offer a clear view of the many reaches of our fascinating planet. An index and a 'read more about it' section add to the usefulness of the book. and he pondered and pondered. but his mind kind of wandered." When Bradley McGogg awakens one morning to find his cupboard bare, he must make a decision. After much 'pondering' it comes to him that he should use a visit to his new neighbors' homes to find sustenance for his rampantly ravenous body. Hmmm! Not an auspicious start to his finding food that fattens. On he hikes to Mr. Bear and Mr. Rabbit. Honey coated carrots are not much better. When he notices what Miss Moo is snacking on, he decides to skip that visit and make his way home. Imagine his surprise when he arrives at his log and finds it infested with BUGS! "But when he got home, Bradley croaked with elation. His hall was a-crawl with a pest infestation." Yummy as all get-out and a ton of fun to read. The illustrations add charm and character, conjuring up earlier times with a wee bespectacled mouse in an apron-covered cottony dress (much as my farm aunts often wore), a vested hare in a tailored coat and a Birkenstock-wearing frog, sporting striped overalls and a splashy tie. The setting is rural, and serene. Bradley is an expressive and courteous visitor despite his aversion to the foods that others choose to eat. One of those things we loved to do when I was teaching kindergarten was SING out loud and proud! I love to sing; but I don't have a great voice. Kindergarten kids don't care...they just love to sing along; and they love especially old familiar songs. So, we started our days with old favorites and tried to learn at least one new song each week. It meant that the singalongs were quite extended by the time we got to the last week of school; but, we sang with great gusto. The sound of the language, the rhythm of the music, and the rhyming words helped them as they learned the nuances of communication. Many of those songs I still sing when I visit in classrooms. They are a great distraction from sitting for any length of time, sharing stories and conversation. In her companion book to The Neighborhood Mother Goose (Greenwillow 2003), Nina Crews gathers together children from her Brooklyn neighborhood and uses their multicultural images to bring a sense of joy and energy to its pages. There are 34 songs, most familiar, in the collection. Each is accompanied by beautiful photographs of children in playgrounds, at home or in neighborhood settings. "This collection includes folk songs, spirituals, nursery rhymes and pop tunes from the eighteenth, nineteenth, and early twentieth centuries that delight us to this day. In researching this collection, many sources were used -"
For those who want more, she has included a guide to those sources. It finds space at the back of the book. Now, get out there and lift your voices in parks, at the beach, and on your neighborhood sidewalks! because you don't know how. There are so many things that babies don't understand. Luckily, this one has a big sister to make the path smoother and easier to follow. After all, she has a lot of life experience. Her baby doesn't have hair (she does) and can't sing songs (she can and she knows the words and the tune); and she can name and list a multitude of other things he can't do, eat, avoid, or know. The lists are endless. While he is carried in a backpack and entertained in his crib, she is busy showing all those things that she CAN do: read, dance, walk, dress-up, write and draw. because ice cream isn't appropriate for babies. And you're not allowed to TOUCH ANYTHING." The list of toys that cannot be played with is accompanied by an illustration that shows the baby playing with 'boring' rattles, blocks and wind-up toys while the sister makes contented conversation with a host of Barbies. Ah, me!! and give me a headache. it's just a scary dream," and then you feel better." If you are expecting a new baby with an older sibling, or know someone who is...this is a perfect book to give as a gift on your first visit. Imagine the delight of having someone read this when the new baby settles and there is undivided attention to give to the big sister, or brother! to fly, I won't know if I can. I won't know if I can't." We all find ourselves teetering on the edge of a warm and comfy nest (metaphorically, of course) at many times in our lives. The decision to go or stay is a hard one for many of us. Change brings discomfort and apprehension. Holly Meade offers reassurance that we have the choice. We will, or we won't. We can, or we don't. Her soft and engaging watercolor backgrounds offer bright and sunny blue skies, while the warmth of the greens and browns in the collage overlays sparkle with diffused light. As the bird contemplates the many advantages and disadvantages of taking the risk and trying its wings, the air is filled with the brilliance and movement of other birds enjoying their freedom. It's not easy to take that leap of faith. The author grabs our attention before we even open her book, with the word endeavor. How often does it come up in conversation these days? It is a signal that the language chosen to tell her tale is elegant, diverse and often, unusual. I love that about this book. The writing is poetic and a pleasure to read out loud, a feast for our writing lives. Children will be encouraged to take some risks with language when they are writing; while also being guided toward accepting the challenges that life offers. This is a perfect book to be shared with the very young and with others along the way; are we not all faced with making decisions every day of our lives? All we can do is take flight and see what happens! What could be funnier than that for young readers? Can you just hear them repeating every response that Ralph gives to the questions asked of him? I sure can. The author lets her audience know immediately that Ralph is a dog that talks. Young kids can suspend belief and enjoy what this book offers from the get-go! They will soon be caught up in the humorous exploits shown in the clever and inspiring illustrations. The questions are asked of Ralph and his responses are an ongoing variety of barks. Finally, he tires out and needs sleep to ensure the ability to answer even more questions tomorrow. The only sound we now hear from him is the proverbial ZZZZZZ! Humor abounds and kids will be tempted to try and guess the answers to the questions put to the energetic and lovable Ralph. The collage illustrations are, at once, familiar and exemplary. 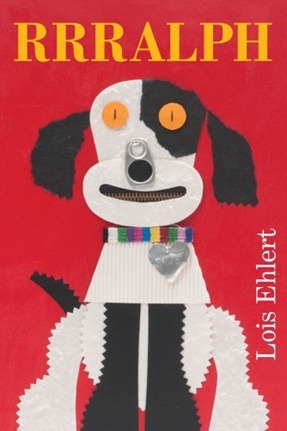 Lois Ehlert helps me believe that I can make art from found objects...that is what I so love about her books. There is so much to see, and such creativity at work with gorgeous bright colors and large, readable print. They are an incredible incentive for children to use their imaginations to create their own lovely collage art. What a wonderful addition to her most impressive body of work! at 4th Noodle, New York City. and had the faintest aura of grease." After Ginny's favorite aunt dies, a package arrives from her containing thirteen envelopes. The first one contains one thousand dollars and a note telling Ginny to buy a plane ticket. She does as she is told, as she's not doing much while she awaits the start of her final year in high school. Soon, she's off to England with instructions to find the place where Peg was staying when she died. It's obvious from the start that Aunt Peg marches to the beat of a different drummer. She just up and left one day years ago without informing anyone, needing to find a better way of living that would feed her soul. Her profession, an artist, seemed to explain to her family the reason for her sudden departure and her failure to make regular contact. Ginny is given additional instructions that are to be followed to the letter. She can take only a backpack. No electronics, no travel guides or money and no contact with home while she is gone. Each envelope must be opened in turn, so long as the previous one has been read and the instructions followed. Ginny is meant to discover what led Peg to live the life she chose, and to see who she really was. Perhaps, along the way, Ginny will make some discoveries about herself. Ginny is 17, a bit shy and too reserved to just set out on an adventure with no plan in place. However, she is intrigued by the envelopes and their instructions and she does exactly what Aunt Peg suggests, despite some bumps in the road. She meets Keith, an artist, and Richard, who was her aunt's flatmate. Richard has much to share with Ginny. I really enjoyed the settings, and felt that the author had travelled the same paths, giving them an immediacy and reality that definitely held my interest. I read it quickly and with the same sense of adventure that Ginny was experiencing. From New York to London, to Paris, then Amsterdam and Greece and back to London. It was a most intriguing journey! I found myself eagerly anticipating each new lesson, and truth about Aunt Peg and about Ginny herself. I look forward to its sequel, which is sitting at the top of my TBR pile in the library. ""For reasons he could not explain, Walter had been born with the ability to read. He had never known another rat who had this ability, but from the day he opened his eyes he was able to decipher printed words." What a truly lovely and inspiring story! I had not read it before and was delighted to get a copy for review. I will read it again, and share it with many. You know there are books about rats that turn your initial impression of them on its ear; Justin and Nicodemus who help the Frisby family, or Remy from Ratatouille, come to mind. You are in for a treat when you meet Walter, a literate and lonely mouse who lives in Miss Pomeroy's house. His ability to read is a godsend, as Miss Pomeroy is a published author whose library boasts a plethora of wondrous books that hold his attention and provide long hours of learning and relaxation. As many of us have discovered, once you start reading it is nigh on impossible to stop. Such is the case for Walter. This compassionate tale of warm friendship offers gorgeous language that begs to be read aloud. It is short but packs a wallop! I marked many passages to be read again and even copied into my journal. There were so many times that I just wanted to read it to someone right then and there. This is a book that I will buy for my gift pile...to be given to anyone who might love the tale of an honest, inquisitive, admirable and simple RAT. 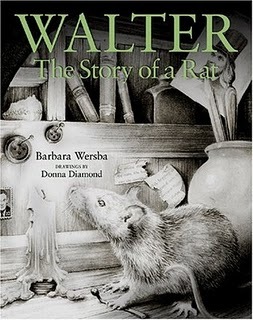 Donna Diamond's black-and-white illustrations offer images that add to the quiet power of the story...giving the reader a window into Walter's world and his growing curiosity and admiration for Ms. Pomeroy. There are framed full-page illustrations infused with light and many small spot pictures that add interest and understanding. What magic there is in a life of reading! "In English, Miss Cowper was throwing us into the Introduction to Poetry Unit like it was as all-fired important as the moon shot. You know, there are good reasons to learn how to read. Poetry isn't one of them. I mean, so what if two roads go two ways in a wood? So what? Who cares if it made all that big a difference? What difference? And why should I have to guess what the difference is? Isn't that what he's supposed to say?" If you didn't love Doug Swieteck in The Wednesday Wars, you get another chance in this powerful and engaging follow-up story. Doug has moved to a new town and he is not too thrilled with life in 'stupid Marysville'. As with all change, there is an adjustment period. His family is in turmoil, and the move is made because his father wants a new job; what his father wants is what happens with the family. He is a bitter, angry, mean-spirited man who treats his wife and children with disdain and brutality. Lucas, the oldest son, is in Vietnam. Christopher is on his way to trouble with the law, and being a clone of his father. Doug is the youngest of the three, an eighth grader with a lot of anger and resentment. He hates 'The Dump' they live in, and has no desire to make friends with people at school or in town. It happens gradually; but, Doug finally finds his place among the townsfolk and within his own family. Gary Schmidt creates a young man to be admired in this superb character study. He made me laugh, grit my teeth and even cry. 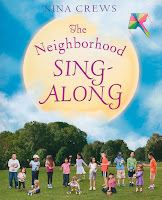 It is sure to be on the Newbery list this year! There are so many quotes I would love to share with you. He is funny, endearing, agonizing, and loving. You will NEVER forget him. Doug's voice is strong and sure, while dealing with many of the same issues that plague all eighth graders. He is interested in a girl, angry with authority, searching for self and discovering that he has talents for making friends, art, and being a brother. He is vulnerable when he needs to be, self-assured as he discovers his inner strengths, helpful and dependable for Mr. Spicer and the customers whose groceries he delivers. He is angry about his father and his pitiful parenting, the way his mother is treated by his father; but he is grateful to new friends and supporters. The entire cast of characters is well-drawn...believable, uplifting, anxious to make Doug feel at home. There are surprises but the action builds to them, and doesn't knock the reader in the head with them. Gary Schmidt is consistent in building character and relationships that matter and work. He is such a skilled writer. He ensures that his readers are privy to some major historical events...the Vietnam War, the moon landing, the National Physical Fitness tests and standards and even some Yankee history. There are some difficult issues. It certainly will have middle and high school readers wanting to discuss its many compelling scenes. It is a great readaloud and now has a place on my 'keepers' shelf...right next to Trouble, The Wednesday Wars and Lizzie Bright and the Buckminster Boy. If you are wondering what to read this summer, you cannot go wrong with these powerful reads. "I wrote Jumped to examine the role that we all play in peer violence. If we're crowding around fights, we're playing a role. If we're recording, posting, viewing, giving a 'playback' of these acts of violence, we're playing a role. No one is exempt." In three powerful, poignant and incredibly distinct voices, Rita Williams-Garcia tells of one day in an urban high school...how it begins, how it goes forward, and how it tragically ends. Leticia is a gossip girl. She has escaped a make-up math class in hopes of meeting up with friends prior to the first bell of this school day. She is in the right place at the right time to see Dominique threaten to beat another girl at the end of the day, for cutting her off in the hallway. For Dominique it is the final straw in a series of bad breaks. Trina, a valley girl with self-confidence oozing from her pores, is totally unaware of the alleged transgression and hears nothing of the threat. It doesn't take long for Leticia to get on the phone with her best friend and spread the news. The author moves back and forth in the three voices to give the reader context for the events as they play out. The strength of each voice keeps the drama intense and offers a 'can't stop reading' ride, through to the final page. "I'm just a baller. A guard. A floor general running the show. Making plays happen on the court. That's from having eyes on the court; seeing where to be; beating the ball for the steal; reading the D; getting the ball in the hot hands, the open hands; charging into the paint or taking a charge; shooting from the high post." All of that basketball gone because of failing grades, a teacher who will not listen to her complaints and a coach who will not bend the rules about keeping her grades up. She is benched. Basketball is what makes her who she is and is the only thing she loves to do. "In case you're wondering, that's not conceit. It's just fact. It's like when you see a Picasso - those colors, those shapes, those crazy mixes - and you hear the music in the paintings, you can't help but say, "That's dope." When people see me, they see walking art. They pause because the hair is bouncing, the light brown eyes are twinkling without trying, the skin is caramel and creme, the galletas are shaking, the body's untouchable tight. What? They can't help but stare or step up." "Can you believe my luck? I sneak outside to skim dirt, and dirt finds me before I'm down the stairs. It's all too good to waste. Every second counts. The bell will ring in five minutes. I fold the bathroom pass down to a padded wad and jam it on the inside of the door lock. I step outside the building where the reception is good and hit 3, Bea's number on Celina's speed dial." Powerful and worthy of a read in any middle grade and high school classroom. There is much to discuss here! WOW!!! 900 posts and 9000 visits! I just wanted to take the time to thank everyone who stops by to see what I'm reading and writing about these days! I just passed 900 posts and there have been more than 9000 views since the counting started. I am honored by your support and delighted to be sharing my passion for wonderful books. I am continually amazed by the books that are being written for children and young adults (and older readers, too) and feel so blessed to have the opportunity to read them and then to have my say about them. As with any blog, the books I choose to post are the ones that speak to me. That is the real strength of the blogging community. We get to read what others are thinking and about the books that enlighten, entertain, enrich their lives. Thanks so much for your support and I hope that you continue to find books of interest to you here! Can you hear the guffaws? And look at that face on the front cover! Tucked in sleepily with his own stuffed leopard, the 'ludicrous' leopard is rudely awakened by a loud, boisterous, and unfamiliar sound. It's loud enough to make him want to get to the bottom of it. Off he goes, and along the way, meets a 'dozy' giraffe who decides that the hullabaloo is worth investigating. There are a lot of animals they didn't see, and a big surprise when they discovered what was making all that noise! Something needed to be done! The results are agreeable to all...until they find themselves awakened once more from peaceful slumber. A perfect ending! The language is luscious, the text is bright and enriching. 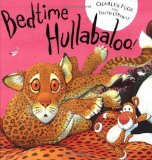 It is such a fun book to read aloud; it may even do damage to your vocal chords. The illustrations are realistic, with a humorous twist. There is much to notice as the pages are turned, including a baboon reading 'Goodnight Moon'... to the moon, of course. The animals share their feelings with endearing expression. This is a book that offers its readers much in terms of strategies for writing....onomatopoeia, alliteration, repetition, rhythmic prose and a boatload of fun! It's perching on a stone. It has beautiful orange wings with teeny black dots. the butterfly flutters away into the meadow. The family has come to the river to play, enjoying the beauty of the day and of their environment. When a butterfly happens by, the wee one follows along as it takes a path into the meadow and beyond. It moves quickly and she tries to do the same. As she goes she smells the 'toothpaste' scent of flowers, feels the tickle of the grass on her legs and the light touch of the breeze in her hair. Soon she is surrounded, only her hat showing above the tall plants. The butterfly has disappeared and so has her family. A grasshopper lands, then bounces away...leaving her alone and lonely. She closes her eyes to the fear, and hears the many sounds around her. The river seems far off; then she hears the best sound in the world...her mother's voice. She opens her eyes to a peaceful smile and the warmth of her mother's presence. All is well! Because it is told in first person, we feel an immediate affinity to the wee one as we make the journey with her. 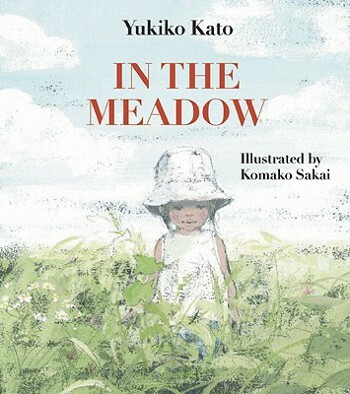 The artwork is perfect in tone and adds the gentlest touch to this charming story of a girl and her love of nature. The green world that offers an open invitation for exploration is lush and soothing. The emotions felt are evident in each step she takes offering the reader a personal connection to this little girl and her newest adventure. 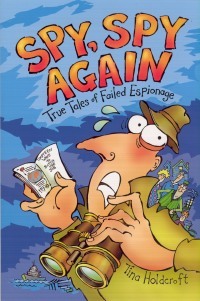 It's great to find a new series of books that will appeal to those kids who reluctantly choose reading as a pastime. There are so many other distractions for them. When I read this book last night I thought of four or five of those readers who will find that it has just enough adventure, humor, and family dynamic to hold their attention, and then have them looking for other similar tales. The kids seem real; full of energy, living near the water, and willing to follow Calvin into numerous mishaps. Calvin's heritage is ethnically diverse, having Italian, Filipino, Hawaiian and Chinese ancestors. He lives with his mother and younger sister on Oahu where his days are filled friends, fun and a penchant for attracting trouble. His father lives in Las Vegas with a new wife; Calvin does not see him. Stella has come to live with the family, and is a pain in his neck. At 15, she is not always pleasant, likes to be the boss and acts as a helper for his mother with Calvin and Darci, while Mom is at work (Calvin actually calls her his sister in one scene to avoid the word 'babysitter'). "I have never based a character on myself, though I have shared many pieces of my life in my stories...Still, part of boring me is in every lead character I have ever written. It’s the part that believes in something, that feels something, that loves or dislikes something...Because Calvin is where it all starts, in the age of wonder. With the young. Character building can never start too soon. And this, to me, is what Calvin Coconut is all about. Choices and consequences, even in the silliest of situations. Calvin is Everyboy." The story has humor, rich scenes of island culture and details about the people who live there. It's accessible to those wanting to read 'a first chapter book', providing action, dialogue, friendship and family drama. A map of the town and a variety of accompanying sketches will help young readers feel a part of Calvin's world. Now press the yellow dot again. People who love books and love sharing them with children are always watching for the next 'great' book that they cannot imagine being without...we want quality and we are overjoyed when we find it! This is a book that you will grow tired of reading; while planting a big, huge smile on your face. Once started, there is no end in sight. It seems so simple. Yet, it is the first time I have seen such a book and I can't wait to share it all the time. What genius imagined it, and then brought it to children everywhere? 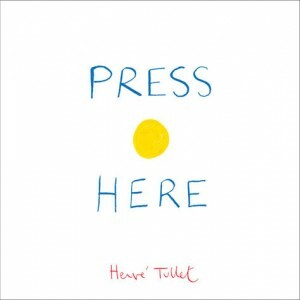 I hear tell that Hervé Tullet is known in France as the 'prince of preschool books'. It is no wonder; I will be on the lookout for any past and future works from him. It begins in mystery. There is no visible narrator, but someone is telling the reader what to do now and then next, and then next...and so it goes. Now, it isn't going to be much fun unless you follow along with the instructions given. If you are game, you are in for a great time! With each turn of the page, things get a bit more complex. Pressing the yellow dot makes another appear. Rubbing it makes it change color. Tapping it adds more to the page. What will happen if you shake it, or maybe even tilt it? Oh my gosh, what about clapping? And, if you want to do it all over again? Why, follow us right back to the beginning! There I was sitting in the living room, following each instruction to the letter, with concentration and delight....all alone...wanting to know what might happen next. Imagine when you share it with a little one who believes? "Look at these hands, Joseph. like a sparrow in springtime? This is an incredibly gentle and telling tale of a doting grandfather and his grandson. As they spend time together, Grandpa shares stories with Joseph about earlier times in his life. Times when he could quickly tie needed knots, play fast songs on the piano, shuffle cards with the best of them and throw a mean curveball. 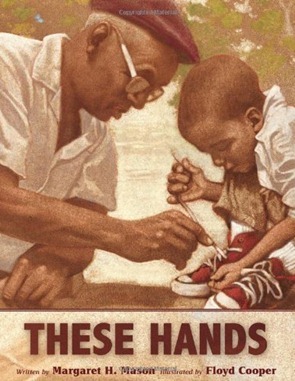 Joseph’s grandfather’s hands can still do many amazing things. All that experience comes to good when he helps Joseph learn to tie his shoes, play the piano, hit a baseball. Sadly, he lived at a time when there were things his hands could not do. Working at the Wonder Bread Factory his hands could not touch the dough. They could sweep the floor, load the trucks; but they could not touch the bread dough. White people didn't want to buy bread that had been handled by black hands. In response to those conditions his hands helped with other things. They helped organize protests, sign petitions, carry signs and hold hands in solidarity with others who were not allowed the same privileges as white people. Joseph, in turn, is pleased to show his grandpa the many things that his hands can do, thanks to patient guidance and love. I must admit I bought this book because of my love for Floyd Cooper's artwork. I am equally enamored of the simply told and heartfelt story. The illustrations are what I have come to expect from Floyd Cooper; softly beautiful images that glow with warmth and light. There is no edginess here...no change in the tone of the story despite its memories of times past. In telling Joseph of that past, Grandpa reflects on the actions that brought change to his people and better days for his grandchildren. I stare at him, too shocked to speak. Things in Andi's house are not going well...to say the least. She is trying to cope with her brother's death, her mother's depression and her scientist father's continued absences. Enough? Well, not quite. Her prep school is threatening to expel her because of poor grades and unfinished course work. Now, Dad comes home. He puts her mother in hospital to get help, and takes Andi off to Paris with him. She doesn't want to go. She has no choice. She makes a deal. If she finishes an outline and the introduction to her senior thesis, he will allow an early return home. Andi is determined to get the work done and be gone. Her chance meeting with Virgil, and the discovery of a diary belonging to Alexandrine Paradis offer distractions that may put the deal in peril. As she reads the diary written at the time of the French Revolution, Andi is surprised at how much she and Alex seem to have in common. It connects Andi (and the reader) to the past and gives convincing glimpses of what life must have been like at the time. They are both characters to admire and understand as they find common connections across the centuries. Andi loves music and is passionate about the influence a late seventeenth-century composer has had on modern music. That musical history lends an interesting bent to the story. When Andi meets Virgil she needs the calm and stability he offers. She is fascinated by him. Their love of music is their common link. Alex is a highly acclaimed actress who meets the Prince and is equally fascinated. They share the events of the Revolution and are drawn together by it. The setting is so authentic, you can almost feel yourself in Paris, today and in much earlier times. was not my soul that was taken, no. Two of my teeth? I think not! my calf and I must disappear." Children are always on the lookout for books about elephants. There is something so appealing and intriguing about the giant pachyderms. They can generally find those books in the nonfiction section of the library; but there are more and more books being written about these graceful, intelligent creatures on the picture book shelves. Think Elephant and Piggie! 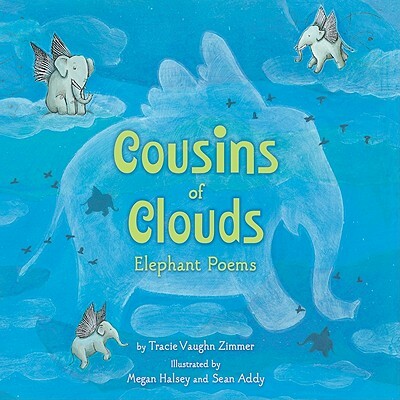 In her new book, Tracie Vaughn Zimmer introduces us to elephants in a series of twenty-five poems while also feeding our need for factual information. There is so much that endears this gentle giant to us. 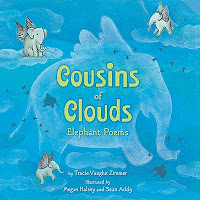 The text boxes that accompany the poems offer a connection between poetry and the history of the elephant, through time and around the world. better yet, I'll dive in." "Elephants rarely seem happier that when they are pitching mud on each other and slathering themselves in gooey clay. Although an elephant's skin feels rough to the touch, it is actually quite sensitive to sunburn, insect bites, and rashes. So while it looks only like play to us, the mud spa is necessary for an elephant's survival in harsh climates." There is much here to learn. Using variety in form for her poems (haiku, free verse, musical rhythms, captions, a letter, a riddle), the author offers an abundance of material that her audience will find quite fascinating. I have read it a number of times and each time I keep one more fact in this old head. So much I did not know...it's true that we do learn something new every single day! "James had told me about riding the bus. He said if you weren't careful, you could get laughed at or yelled at. You could get pushed around or even pounded. Big kids would steal your lunch and your money and even your football card collection! Sometimes I wondered if he was exaggerating a little. But if even half the stories were true, I was in trouble." I can't wait to read this book in the fall...just get me some kids who ride the bus and we'll have them rolling in the aisles. And, breaking all of James' rules! Our narrator is very, very apprehensive about taking the school bus on his own. His older brother has much to share about his own experiences and ten rules to follow if he wants to make it to school and home unscathed. It is a daunting task. It doesn't take long for it all to start to fall apart! "RULE ONE: Never sit in the first row. The second row was filled - and the third row, too. There were kids of every size and shape and color on the bus, and every one of them was staring at me. I felt like a zebra at a lion party." That is only the beginning. He goes on to break almost every single rule his brother has given. He makes eye contact, he touches someone's stuff, he talks to a girl and he lets his imagination run wild with the bully beatings that could happen every day from this day all the way through college. When that initial ride is over, he makes a beeline to his classroom and settles in for the day, which goes quite well. "At recess I was watching a game of kickball, and I saw the talking girl from the school bus. She was the captain of one of the teams, and she was really good! Anyway, while she was waiting for her turn to kick, she came over and talked to me. And talked, and talked." Things are looking up; then, at home time, his bus is nowhere to be seen. Well, he doesn't recognize it among the 'thousands' of buses that are pulled up to the school. His guardian angel talking girl saves him once more by calling out to him. He's last on (another rule broken) and he has to sit beside the big bully he met earlier. While sitting together he makes a discovery...he and the big kid might share some of the same fears. A short, polite talk with the bus driver brings a solution and all is well. James is anxious to hear about his day; he listens and then learns that one rule has been added: "Never, absolutely never, pay attention to your big brother's list of Ten Rules You Absolutely Must Not Break if You Want to Survive the School Bus!" Well, yes. I have to tell you that the acrylic artwork adds so much fun and depth to the tale told. From the title page where our narrator sits diligently watching a science show on TV while his mother pointedly lets him know his time is running out, to the school bus coming over the hill in early morning filtered light, to the expressions exhibited on the final spread by the now experienced bus rider and disheartened advice giver, kids will eat it up and ask for more. I repeat, I can't wait to share it! "Close to 1,600 bird species have been recorded in the tiny country of Ecuador. It is a bird lover's paradise with strange species everywhere. I see three favorites while bird watching: a colorful motmot, a laughing falcon, and a secretive ant shrike." Well, it's lucky you are that I am not the writer of this book! I had to go and look up information on each of those three birds. I had not heard of any of them. 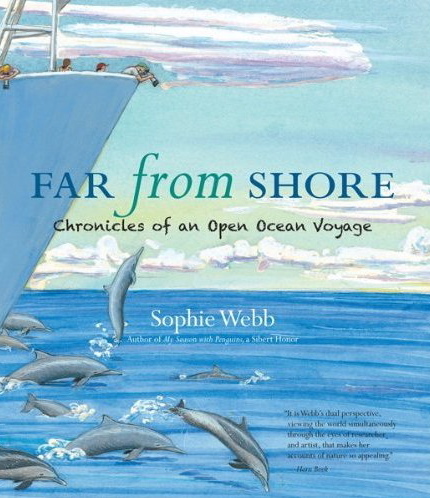 That is the sheer delight and benefit of having people like Sophie Webb writing for our children. "It was a long time in the making and at times I wondered if I would ever finish it. But it was also thoroughly enjoyable to make an excuse for myself to paint and write about all those fantastic creatures found in the Eastern Tropical Pacific, a part of the ocean I have come to love." And love it she does, if this book has anything to say about it! She has proved before how adept she is at both observation and art. in two previous books, My Season with Penguins (Antarctica) and Looking for Seabirds (Alaska); and here she does the same while exploring the open ocean. It takes the same format; an illustrated journal that chronicles the four month journey. There are maps, carefully captioned diagrams, graphs, detailed drawings of the weather, life on ship and the abundance of ocean life that is there to see. "It's time to start looking for critters. It is ten minutes past sunrise and the light is good. We start to travel along a set course, what scientists call a transect. Soon after we start, Cornelia yells, "Dolphins!" All scanning stops and everyone focuses on Cornelia's sighting. She swings the big eyes in the direction of the dolphins. Using her hand-held radio, Cornelia calls the captain on the bridge deck below us, where the ship's steering controls are located. "Bridge, flying bridge--we have dolphins," she says." Sophie is such an inspiration to her readers. Her perspective is real, frank and filled with the personal stories that make her amazing trip accessible to her audience. What an adventure! Thanks for taking us along, Ms. Webb. this down because she said I could. This story will find its way into the hearts of many...young adults and people like me, too. Jake tells it with energy, passion and intelligence. He doesn't fit the image of a small town teen as is expected in his small town. He is troubled, has anger issues, a sad sense of self and a fierce love for Skye. He has loved her since kindergarten. Taking us on a wild ride over the course of 48 hours, he shows us both vulnerability and strength as he deals with Skye's decision to leave town. The rumor mill has it that she is pregnant, a fact that she has not shared with Jake. What she does do is leave him a diary to explain her going. Jake is dyslexic and has a lot of trouble deciphering her cursive writing. He also drops the journal and must try to piece it back together in order to fully realize what she is telling him. He has a pretty low opinion of himself...feeling lost. He thinks he has lost his mind, his girl and his way as he tries to deal with life on a daily basis. Feeling helpless sitting around waiting to hear from Skye, he decides to follow her to Halifax. The road trip is harrowing and he lets his audience know it is a story tough to tell. He 'borrows' a car, gets caught in a winter storm and worries relentlessly about his love. As he searches for her, he learns much about himself and comes to accept that we are who we are...tough to take at times but true. He meets many obstacles along the way, not the least of which are a gang of drug dealers, a shaman, and Skye's relentless police officer father. Sheree Fitch has given us characters to love and honor in words that need to be read again and again for their beauty. The voice she gives Jake is heartbreaking and compelling. There is mystery, murder and mayhem here and I promise that it will keep you reading until you have turned the last page. I could not put it down! tail in a mighty arc. He smashes into the root. "Quills are the best!" he cheers." Spike is a baby and not too impressed with the sharp quills that cover his body...their prickly ends get in the way and bother him. Rupert, his best friend, has a totally different view of those spiky things. He reminds the little one that they offer protection, and are not the same as claws and teeth. His reassurance doesn't work. So, he sets out to prove why quills are 'the best'. After all, they provide camouflage amongst the weeds that cover the forest floor. They 'spike' wild fruits and provide juice that is delicious to drink. They even scare bears! Rupert's demonstration involves a lot of KAZAAKing. Spike thinks he can smell Bear and has great concern that they are in danger. That sets Rupert on a quest to prove that the KAZAAK will have its intended result of filling Bear with fear and rendering him helpless in his quest for a delicious lunch. On this day, Bear seems undeterred and in real need of something to fill his tummy. A prickly bit might be just what he needs. He is less intimidated when Rupert's KAZAAK provides a tickle rather than a sharp poke. It seems that Rupert's antics have rendered him 'quillless' and he no longer provides much of a threat. Spike has an explanation about what lies beneath that makes sense to Bear. After all, when Bear sheds his long wintry coat in the spring, he knows that it will just grow again. Does that happen with porcupines, too? And how quickly? It is enough to discourage the huge and hungry predator. Spike does have a treat, after all the grumbling, that gives he and Rupert a chance for a getaway...just in case. We all have things to be thankful for, not the least of which is friendship. Spike and Rupert are great friends, loyal and trusting. I have loved other books by Sean Cassidy...please look him up! His funny, full of energy artwork add enjoyment to this tale of friendship, trickery and appreciating one's own special traits. 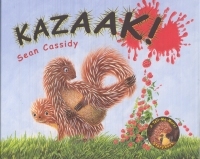 Kids will love adding KAZAAK! to their vocabulary and then finding authentic ways to use it. The author adds a nonfiction bit at the end which gives additional and useful information about the porcupine, while also providing step-by-step instructions for drawing one. A delightful addition to a home or classroom collection.